File extensions are the end part of file names, the part that comes after a dot and is usually 3 or 4 characters in length. By default, file extensions are usually not visible in Windows and, sometimes, Macs. You can change settings to make extensions visible. If you are able to see the extension of a file you will probably be able to determine what the file is used for (especially if the file name is meaningful) and which programs(s) can open it. It is beneficial to be able to see file extensions because when you see one it enables you to rapidly identify the file-type without needing to open the file. Combining the name of a file with its file extension may be all that you need to know precisely what the purpose of the file is. NOTE: changing a file extension will not change the file into another file type nor have the characteristics of that other file type. For example, changing a Photoshop document extension from .psd to .jpg will not allow it to be displayed on a web page. The .psd file type cannot be displayed by a web browser regardless of its file extension. There are hundreds, probably thousands, of file extensions. The following sites provide more information about them. 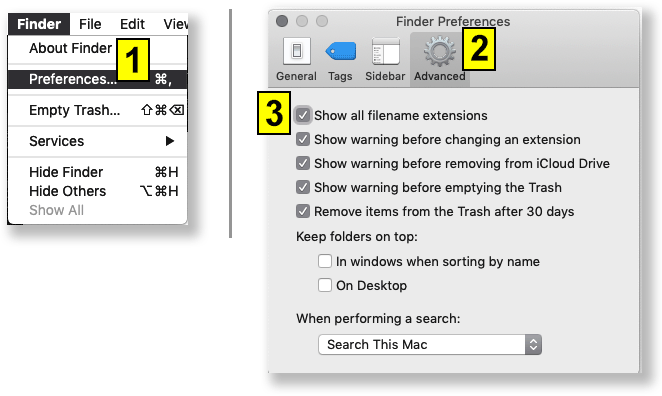 First, open the Finder's Preferences. If you don't know how to select the Finder, hold down the Apple (Command) key ( ⌘ ) on your keyboard and, as you hold it down, tap on the Tab key again and again until you select the blue smiley Finder icon: - then stop tapping the Tab key and remove your finger from the ⌘ key. Now you are set to the Finder. To be certain of this, the word Finder ought to be visible to the immediate right of the  icon in the upper left of the Mac screen. If not, try the procedure in the bullet point item directly above. Next, from the Finder menu, select Preferences... see item 1 in the illustration below. The Finder menu is to the immediate right of the Apple menu  - see illustration below. In the Finder Preferences dialog box ( 2 ). Enable Show all filename extensions ( 3 ). But note that the Windows 7 instructions state that the control panel includes Appearance and Personalization whereas my Windows 7 Home Premium does not. Instead open Folder Options. Right click on Window's Start button. Select Explore or Open Windows Explorer or File Explorer (depending on your Windows version). Windows Explorer (or File Explorer) will open. Do not confuse this with Internet Explorer, which is an old Microsoft browser. Internet Explorer is used to view HTML files and the files that they request. Windows Explorer is used to view a list of and manage files and folders on your computer. On the left side of the menu bar click on the Organize button and select Folder and search options from the menu. In the dialog box that opens, click the View tab. * The words "known file types" suggests that there are file extensions that are unknown to anyone, which is probably not true. Open Windows Explorer (or, File Explorer on Windows 10). If it is not already opened, please open Windows Explorer or File Explorer (this depends on the version of Windows). Right click on the Start button in the lower left corner. Select Explore or Open Windows Explorer or File Explorer, again, the choice depends on the version of Windows that you are using. Click on the View menu to open the ribbon for it. On the upper right side of the menu bar there is a button that lets you set the type of view of the folders and files. The choices are either icons, names, or various combinations of the two (see next illustration). Select Details. I always recommend using Details view because it provides the most information. 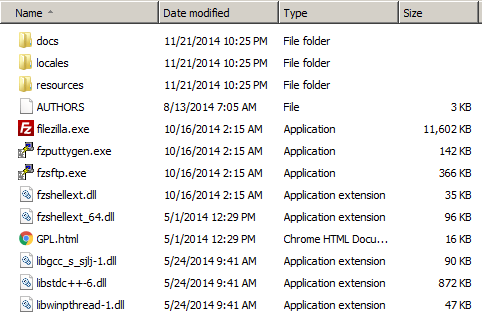 Follow steps 4-5 in the Setting Windows to display file extensions section above. In the top part of the dialog, in the Folder views section, select Apply to Folders, then OK it. Provides almost no information other than file and folder names. The icons themselves can be deceptive. In the image below, the Google Chrome icon (partially shown) is used to represent an HTML file. The icon is being shown because I manually set HTML files to be opened in Chrome when the file is double-clicked. However, the Chrome icon suggests that it is only for use in Chrome or that it is some type of Google file. Details view provides a view similar to a spreadsheet or database list. 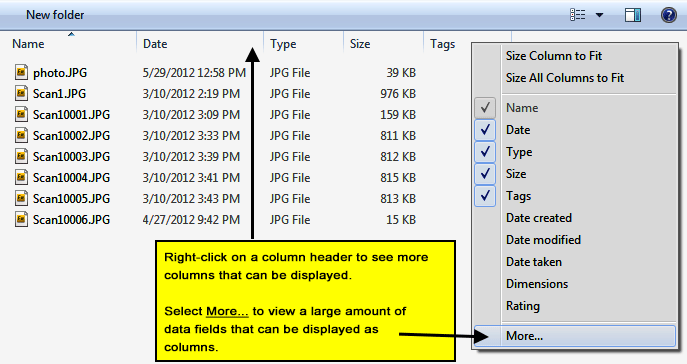 You can sort by any of the data fields (columns) by clicking on the column header. Click a second time to reverse the sort. By default, you are provided with the data fields (columns) containing the name, type of object, and, for files, the file size. You can add other columns/fields by right-clicking on any of the column headers and selecting from the menu of options (see image below). But note that the database fields that can be associated with a file varies depending on the file type that it is. For example, music files and Microsoft Word files have many fields that are editable. One field that is available for images is dimensions, and I recommend that you display that column if you work with images. Click on the More... menu option (above, right) and you will be shown an astounding array of fields that you can display in the List view. 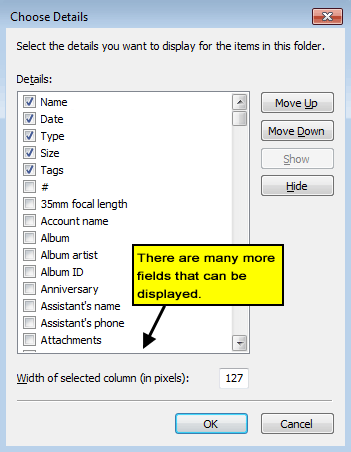 But, again, note that the data fields that can be saved with a file varies with file type. Note that if you right-click on a file and select Properties you will see the data and field names associated with that type of file. If the data values are editable, you can click on the value and enter or edit the value.